To make customizing the appearance of RadComboBox as easy as possible, the control uses skins. A skin is a set of images and a CSS stylesheet that can be applied to RadComboBox elements (items, images, etc.) and defines their look and feel. To apply a skin to RadComboBox, set its Skin property, either using the properties pane or the RadComboBox Smart Tag . Set the EnableEmbeddedSkins property of RadComboBox to False. The stylesheet for a RadComboBox skin has the name ComboBox. [SkinName].css and can be found in the ...Skins/[SkinName] directory. The images are found in the ...Skins/[SkinName]/ComboBox directory. 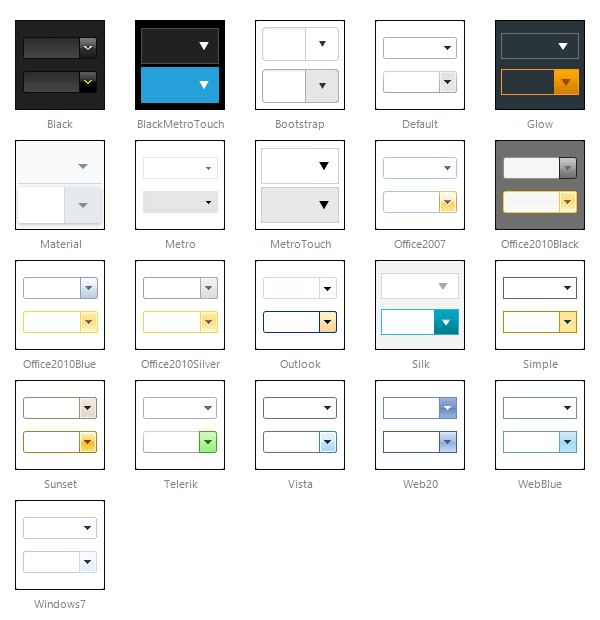 For example, the stylesheet for the "Black" skin is called ComboBox.Black.css and is located in the ...Skins/Black directory.The images are found in the ...Skins/Black/ComboBox directory. The images are referenced by name from within the stylesheet. For more information on the CSS File structure, see the Understanding the Skin CSS File topic.